Outside the hearing on former ExxonMobil CEO Rex Tillerson's nomination as secretary of state, 15 people dressed as T-Rex dinosaurs joined hundreds of protesters. In addition to calling Tillerson a climate dinosaur — a reference to Exxon's history of climate change denial — the demonstrators' rhetoric centered around one phrase: #ExxonKnew. The allegation refers to two damning investigations conducted by the LA Times and Inside Climate News in 2015, both of which found that Exxon leaders knew humans were causing climate change as early as 1977, yet intentionally misled the public about global warming while lobbying the government to block emissions regulations. The reports sparked outrage, spreading online with the hashtag #ExxonKnew. Inside Climate News' series, which was published after an eight-month investigation, suggests that Exxon was briefed by scientists and even conducted its own robust climate modeling programs for years, all of which suggested that fossil fuels were to blame for spiking global temperatures. (The LA Times' report confirms the same.) But despite this information, Exxon continued to push for the appointment of officials who broke with the mainstream opinion on climate change, and set up the Global Climate Coalition, a lobbying partnership devoted to opposing controls on carbon pollution. A 2007 report from the Union of Concerned Scientists also suggested that Exxon used the same tactics as the cigarette industry to promote uncertainty about the facts of climate change. Tillerson actually does acknowledge that climate change is a problem (unlike EPA nominee Scott Pruitt and President-elect Donald Trump). However, environmental advocates believe Exxon's record speaks louder than Tillerson's words. According to an analysis by NextGen Climate published by the Huffington Post this week, Exxon gave more than $6.5 million to groups that deny fossil fuels contribute to global warming between 2008 and 2015. The company vowed nine years ago to stop funding groups that promoted misinformation about climate change. Senator Tim Kaine questioned Tillerson about that history during the hearing today, asking him whether Exxon Mobil knew about climate change long ago, despite what the company has publicly stated. Tillerson declined to comment, suggesting that he can't speak for the company now that he no longer works there. "Do you lack the knowledge to answer my question, or do you refuse to answer my question?" Mr. Kaine asked. "A little of both," Mr. Tillerson responded. Both Kaine and various environmental groups took this response as confirmation of the "Exxon Knew" controversy. May Boeve, executive director of grassroots environmental organization 350.org, immediately issued a statement highlighting Tillerson's refusal to answer Kaine's question. "Tillerson is still lying about what Exxon knew about climate change," Boeve said "Tillerson deserves a federal investigation into Exxon's lies, not a cabinet appointment." Stephen Kretzmann, Executive Director of Oil Change International, an organization that works to expose the dangers of fossil fuels and promote a clean energy transition, echoed these sentiments. 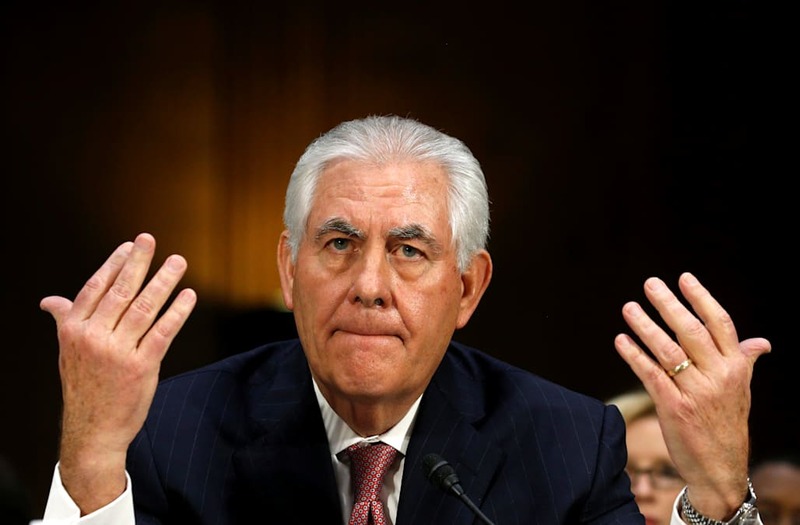 "Unsurprisingly, Tillerson essentially pled the fifth when asked about Exxon's long history of denying climate science, explicitly refusing to answer the question, or accept any responsibility for the actions of the company of which he was CEO for the last decade," he said. "The record is clear: Exxon Knew." Various states, including Massachusetts and California, are currently investigating whether Exxon Mobil indeed lied to the public and its shareholders, since that could mean the company engaged in fraud and violated various environmental laws. In November 2016, New York Attorney General Eric Schneiderman subpoenaed over a million of Exxon's internal documents. Whether or not Tillerson becomes our next Secretary of State, Exxon's past will undoubtedly continue to plague him.